The manuscript in question was for Action Figures – Issue One: Secret Origins. An agent had expressed quite a bit of interest in it, felt it had promise, and worked with me over the course of several months to flesh it out and polish it up. 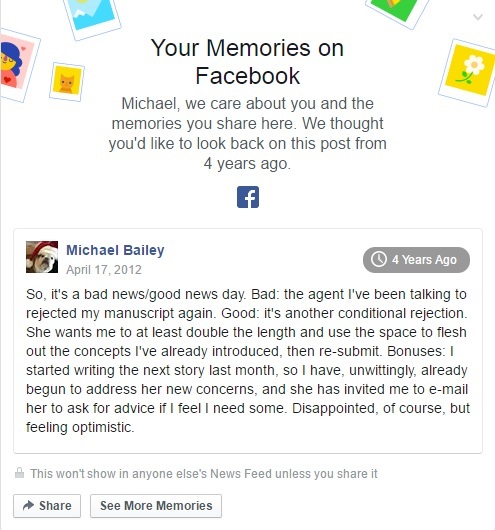 I spent much of that year convinced that, after years of trying and failing, I was finally on my way to becoming a published author. And then in December of that year, I got the crushing e-mail that said, basically, the story was great but there was no market for a YA superhero series. The YA world was still enamored with Twilight and its many, many derivatives and was about to enter its “plucky heroine fights an oppressive government in a dystopian future” phase courtesy of The Hunger Games’ growing popularity, and this agent wasn’t one to take a leap of faith and support a book that wasn’t a variation on what was already popular. Flash forward to about a year after the above FB post. I hadn’t written a thing outside of work-related material (I was still employed as a reporter) and had little motivation to get back to creative writing, but at the prompting of my friend Justin (fellow indie author J.M. Aucoin to the general public) I decided to take a shot at putting Secret Origins out myself. It was an experiment and I went into it with hopes but no expectations. And here I am, four years after that post, with seven books out and several more on the way. I quit the paper and am making a living off my book sales (not an extravagant living, but I’m making money), I have fans who e-mail me to offer kind words and inquire when the next book will be out, I’m doing public appearances such as book signings and discussion panels…it’s like I’m a real author or something. It’s hard to summarize the point of all this without resorting to some worn cliche, but I’ll do it anyway. This was a case of a door closing and a window opening, and following a road less traveled to realize a personal dream. It wasn’t how I planned or expected things to go, but taking a risk and trying something different paid off. If you’re a creative person — be it a writer, an artist, an actor, a singer, a musician, et cetera– who finds him/herself stuck in neutral because what you’re trying now isn’t working, be brave and try a different direction. You might be pleasantly surprised at how it works out. I think its incredible. You went from someone who adamantly stated he would never self publish, to being a success story, managing to make a living doing it when so few do. Here’s to the next four years!